Japan and Chinese Taipei opened the day with an afternoon contest. 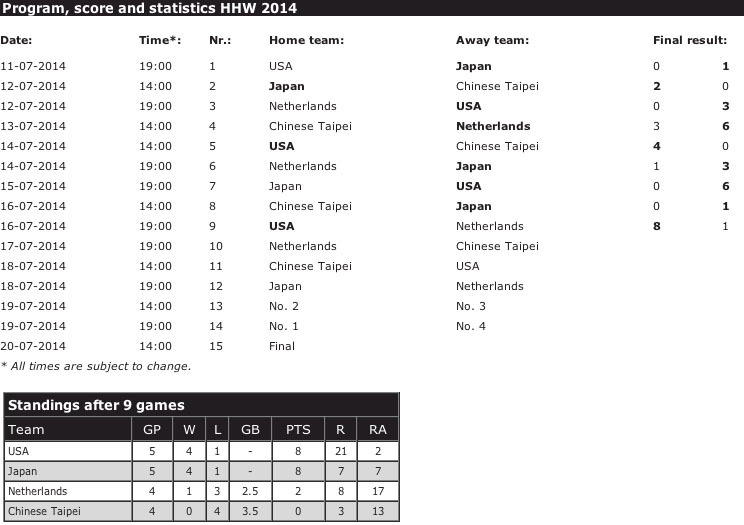 Taipei was still looking for the first victory of HBW-this year, while Japan only yesterday the first loss of the tournament. Until the 8th inning remained a quiet affair on the field. Both teams had very little feeling. On the other hand, the coaches were from the pre-game on their hips: the Japanese Pinch-Hitters and field to track bills were almost not; the same was true for the werperswissels at Chinese Taipei. Japan, however, knew to score when Takuya Sato singled sl Japan, however, knew to score when Takuya Sato singled, advanced on a groundout by Tanaka, three took out on an identical groundout by Yoshida, and scored on a hit by Nakamura to Leftfield. The score was 1-0 for Japan and thus was equal everything about this contest said. HAARLEM, The Netherlands - The USA Baseball Collegiate National Team pitching staff saw its incredible scoreless run end at 37.2 innings as it narrowly missed a bid for its fourth consecutive shutout but the squad rolled to an 8-1 win over the Netherlands in front of a standing-room only crowd at Pim Mulier Stadium on Wednesday. "We were on it from the get-go offensively and put together some really good at-bats all night," Team USA manager Dave Van Horn (Arkansas) said. "We hit a lot of balls hard and even though we ended up with 14 hits, we could have easily had another six or seven. We put a lot of pressure on them with a couple hit-and-runs, we laid down a nice sacrifice bunt and we drove in runners all night long. "It was probably our best offensive day since we got over here. That was great to see and obviously the pitching continues to be outstanding. [James] Kaprielian got us off to another nice start. He was really only in trouble one time and got right out of it and the bullpen was super like it has been all summer." James Kaprielian (UCLA) gave the U.S. another terrific start on the mound, twirling six scoreless innings with just three hits allowed and eight strikeouts to improve to 3-0 on the summer. His performance was the sixth consecutive effort of 5.0-plus shutout innings by a U.S. starter, including all five games at Honkbal Week. A.J. Minter (Texas A&M) added a shutout frame in the seventh before the Netherlands finally got on the scoreboard against Team USA in the top of the eighth with an RBI groundout against Dillon Tate (UCSB). That marked the first run the U.S. had allowed since its opening game at Honkbal Week, ending a run of 37.2 innings without yielding a run, and just the second run it has allowed in the tournament. Tyler Jay (Illinois) struck out the only batter he faced for the last out of the eighth before handing the ball to Ryan Burr (Arizona State) who pitched a scoreless ninth to close out the victory. At the plate, the U.S. recorded a tournament-high 14 hits, besting the previous high of 12 which it set on Tuesday night against Japan. Blake Trahan (Louisiana Lafayette) had three hits for the second straight game, finishing 3-for-3 with a walk, two RBIs and two runs scored. Christin Stewart (Tennessee) matched his effort with three hits and a pair of RBIs of his own as well. Leading 2-0 going into the bottom of the sixth after RBI singles by Trahan and Tate Matheny (Missouri State), Team USA took advantage of a walk, two errors and a passed ball to double its lead to 4-0. The squad then doubled-down once again, tacking on a four-spot in the seventh to move out to a commanding 8-0 advantage and effectively put the game away. The Collegiate National Team will have a day off before finishing out the second half of the double round-robin portion of Haarlem-Honkbal Week on Friday against the Chinese Taipei. First pitch is set for 2 p.m. local time (8 a.m. ET) at Pim Mulier Stadium with Houston right-hander Jake Lemoine set to toe the rubber for Team USA.